One of the main advantage of the Cloud is sharing of the responsibilities by the Cloud Vendor and the Consumer of the Cloud. This way the Consumer of the Cloud need to worry less about the routine tasks and think more about the application business logic. Look here for more on the AWS Shared Responsibility Model. EC2 (Virtual Server in the Cloud) was one of the oldest service introduced by AWS, with EC2 there is less responsibility on AWS and more on Consumer. 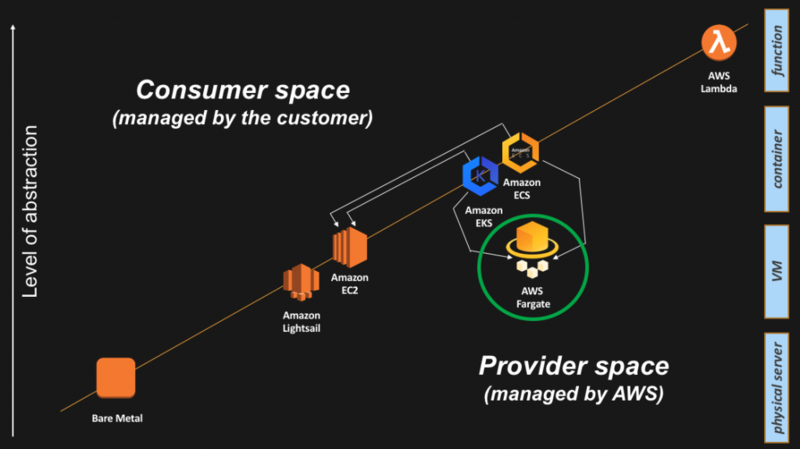 As AWS became more mature and more services have been introduced, the responsibility had been shifting slowly more from the Consumers towards AWS. AWS also had been ABSTRACTING more and more of the different aspects of technology from the Customer. On the other end of the spectrum with Lambda, we simply create a function and upload it to AWS. The above concerns and lot more are taken care of by AWS automatically for us. With Lambda we don't need to think about the number of EC2 instances, size of each EC2 and a lot of things. While driving a regular car we don't need to worry about how the internal combustion of an engine works. A car provides us with an abstraction using a steering wheel, brakes, clutch etc. But, it's better to know what happens below the hood, just in case the car stops in the middle of no where. Same is the case of the AWS services also. The new autonomous cars do provide an even higher level of abstraction, we just need to specify the destination location and the rest of things will be taken care of. Similar is the progress in the different AWS services and in fact any of the Cloud services. Recently I read an article in AWS detailing the above abstractions and responsibilities here. It's a good read introducing the different AWS Services at a very high level. Abstraction is good, but it comes at a cost of less flexibility. Abstraction hides a lot of underlying details. With Lambda we simply upload a function and don't really care on which machine it runs nor do we have a choice on what type of hardware we want to run it on. So, we won't be able to do an Machine Learning inference using a GPU in a Lambda function as it requires access to the underlying GPU hardware which Lambda doesn't provide. In the above diagram with different AWS Services as we move from left to right the flexibility of the services decreases. This is the dimension I would like to add to the original discussion in the AWS article. The Bare Metal on the extreme left is very flexible but with a lot of responsibility on the Customer, on the other extreme the Lambda function is less flexible but with less responsibility on the Customer. Depending on the requirement, budget and lot of other factors the appropriate AWS service can be picked. We have Lambda which is a type of FAAS as the highest level of abstraction, I was thinking what's next abstraction on top of Lambda/FAAS. Any clue?